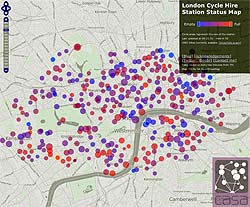 Spatial analysis researcher Oliver O'Brien has produced this interesting live map that visualises current hire bike docking station use. It's updated in real time from TfL data and shows if docking stations are full (red) empty (blue) or the half-full ideal (purple). Oliver's blog Suprageography has other examples of visualisation stuff he's been working on, from Mancunian history to London tube use. This is really cool. Possibly a stupid question but where is the data from? The graph does reveal the true usage of the scheme, which TfL will apparently not disclose. The maximum use in the first days seems to have been 300 bikes at any one time. (That is the difference between the middle of the night and the evening peak) It has grown in the last days, but is still only 600 bikes. And it is very sharply peaked, as O'Brien points out. The average use in daytime seems to be about 100 to 200 bikes. (Perhaps he can calculate a more exact average, and post it). The point is, of course, that usage is so marginal, that it could not even show up in the modal split, let alone transform it, as the mayor claims. The maps show some of the reasons why. The scheme cannot possibly cope with the huge flows of people into (and within) Central London - so it has to be deliberately designed to be unattractive to most of them. It certainly succeeded in that. It apparently can not even cope with journeys-to-work from residential areas within Central London, to jobs also within Central London. The scheme is a failure because it was designed to be a failure. A public cycle hire scheme covering all London, and intended for 10% of modal split, would probably need a million bikes. This scheme is too small, too expensive, and too cumbersome to be of any use. They should have spent Millions on the Infrastructure instead of on these Bikes. If there was a Good Infrastructure for Cycling in Britain then there would be Masses of Cyclists on the Road unlike what it is . As an enthusastic user of the scheme I have to take issue with the criticism leveled at it above. Firstly the charge that it is expensive - it really isn't. I use the bikes to cut time off my daily commute - a fairly common usage. Using it for that alone I'll be making around 500 journeys a year, all under 30 minutes. By Bus that would cost 600 quid (pay as you go for 500 journeys - annual pass £664). By tube it would set me back 900 (payg or annual pass 1032). The cycle scheme costs me 45 quid. How exactly is a saving of 855 quid compared to the alternatives 'too expensive'? I would agree that the scheme needs expansion in the long term, but you can't in the same breath argue that it is both under utilized and too small. The scheme isn't perfect - and the map highlghts some of the issues. However it is far from the fatally flawed fubar that you seem determined to paint it. I smell an agenda of some sort. The agenda is the mayor's. That includes his predecessor, who planned the scheme. The transport planners who designed this scheme know all its flaws, you can be certain of that. They know it will have no measurable impact on modal spit, and that it will therefore not result in "more people cycling'. They know from the experience in Paris that it substitutes distributary journeys in central areas, e.g. metro for 3 stops from mainline terminal. They also know it can only cope with a fraction of those journeys anyway. They also know it is a political gesture, and that is part of a deliberate strategy by both Livingstone and Johnson not to invest in cycle infrastructure. They know public cycle hire schemes in large cities don't work and can't work. One of the main reasons for the failure of the scheme is indeed that it combines under-use with being too small. If everyone arriving at a terminal station (e.g. Victoria) decides to hire a bike to finish their journey by bike, the racks will be empty in less than a minute. The individual racks are so small, that random fluctuations in even low demand are likely to confront potential users with an empty rack. That is a very powerful deterrent to use the scheme again. To avoid that you need a huge reserve. 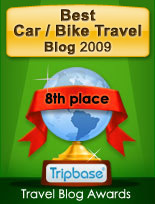 (For comparison, cycle parking at main Dutch stations runs to over 10,000 places). To use the scheme each working day to commute, substituting other modes, then you must live in Central London anyway. The anonymous commenter apparently always finds a bike in the dock, and an empty space at the other end. Only low usage makes that possible. Using the bike hire scheme to commute 5 days a week for 50 weeks a year, with a working day of over 6 hours, costs £12,548. That's expensive. To be fair, the TfL website does say: "To hire for more than a couple of hours it might be cheaper for you to use a company that specialises in hiring for longer periods." Even cheaper, and far more convenient, is buying your own bike. 31/07/2010 - Many phone calls later managed to undock two bikes and use them. The journey for only one of the bikes shows up on line. 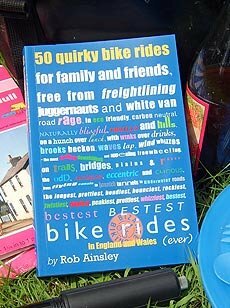 01/08/2020 - Used two bikes for 25 mins each but both are shown as 48 minute journeys and we're billed £1 for each. 02/08/2010 - One journey made on one bike, but both keys billed £1 each. 03/08/2010 - After three calls to customer service I'm told I'm as much as lying about the 25 minute journeys on the 1st and that the docking stations work perfectly. I'm also told my account has been suspended because my bank has declined all of my charges. I check with the bank and nothing could be further from the truth. TFL has billed me a total of £30 for 9 journeys all of which were under 30 minutes. and so it goes on and on. Read the whole thing. The mess is inevitable because of the inherent vulnerability of the docking stations. It probably won't improve, when snow and sleet start falling on the terminals and locking mechanisms.